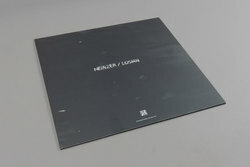 Neinzer, Losian - INTLBLK002. Vinyl EP. Bleep. International Black stick to their word and come good with another EP of high end club material from two young UK producers: Neinzer & Losian. Neinzer, having released on Deep Moves Berlin and the Fabric affiliated Yumé Records presents what could prove to be his breakthrough track in the form of Weiblich - a devastating and highly function piece of sound art meets techno. Losian finishes the job off with the heaviest techno cut we’ve heard in a long time - channeling Basic Channel and passing it through a UK sound-system filter to create a monster ready for the Berghain peak-time dance-floor.